Team Building - Innovative Growth Solutions, Inc.
A belief that they can accomplish more as a team than through individual effort. IGS is able to facilitate one-time meetings as well as highly complex organization-wide processes. 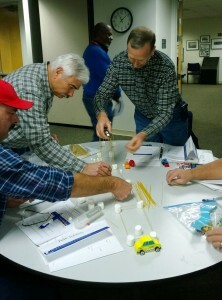 Following an assessment of the team and its environment, IGS will customize a team building strategy. IGS’ overall approach to team building is one of partnership. We work with organizations to define a strategy that identifies and maximizes the team’s strengths and assists in the development of actions and strategies that will move the team toward its vision for the future. These strategies and techniques ultimately create a supportive culture focused on achieving the organization’s mission and vision. Our experience and customization approach will lead to short-term success as well as long-term sustainable change. IGS begins the team development process with a customized assessment of the team and its environment. We then summarize assessment results, present the results to the team for review and develop appropriate team building processes addressing the team’s strengths and weaknesses. IGS has provided facilitation services to many governmental and non-profit agencies including Portland Development Commission, Portland Community College, City of Portland, Clackamas County, Garden Home Community Library, Children’s Nursing Specialties, Tillamook County, Oregon Department of Transportation, Oregon Commission on Children and Families and The Oregon Advocacy Commission.